Teaching The Diary of Anne Frank Play in Middle School: Form a Dramatic Reading Circle with Props! Even though the book, Anne Frank: Diary of a Young Girl, is an excellent resource, I do not have time to teach the entire book during my very crammed-pack curriculum unit! Our school’s literature book has the dramatic version of the book that was presented on Broadway, titled The Diary of Anne Frank (play) by Francis Goodrich and Albert Hackett, adapted by Wendy Kesselman. If your literature book does not have the play, you can easily order it from the official Anne Frank website for $8.00. 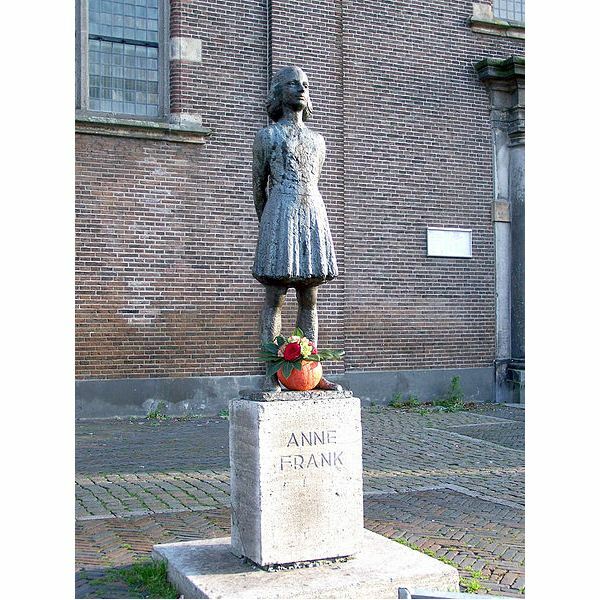 The play can easily be read and analyzed within a four to six-week period and will be an effective way of sharing Anne Frank’s story with your students in a short amount of time. The inner circle is for the students who will be reading their parts that day. The outer circle is for the students that do not have a part. I’ve also given the inner circle the option of sitting on the floor, without desks because I will often have students who get into their part and need the room to move around! Circling up isn’t the only way to spice up a reading of The Anne Frank Play. Before you roll your eyes at me, thinking I’m insane for suggesting your students dress up for their parts, please know that I am well aware that a full dress rehearsal each day in your classroom would be impossible… and a little creepy with middle school students! A great alternative to dressing up (and a much more manageable solution) is incorporating props into your daily reading. Each character will have a prop and use it during circle time to give their character more depth and to engage the students in the reading of the play. When I say “engage”, I mean you will have students begging to play the character and fighting over the props that day, because they want to wear the ratty fur coat or to play with the fake pipe… my 8th graders turn into Kindergartners at center time whenever I bring out the bucket of props! You would be shocked how many teachers have what you need at home and would be willing to loan the item to you, or donate it to your classroom! Any of the other props you can scrounge up at your local Goodwill store. I found a fake fur coat for $3.00 at Goodwill two years ago, and that is the prop my girls fight over the most! Also, check the children’s toy aisle and you can find a pipe (that blows bubbles) and some of the other props for relatively little cost. You will also have students bring props of their own as they get into the reading of the play. Many of my students would read ahead and see that their character was carrying a book or sewing and would bring the items in to use that day. Encourage students to bring what they can (if they want to), and you will find that your prop bucket will grow considerably each year that you read the play.